Just a quickie… I went over to Sherburn today to do the final preparation for next week’s navigation exercise. We’ll be flying to Bridlington and Brough. So I need to get the procedure straight. There’ll be a small chance to revise it before we go. This will be my first proper navigation using a map and nothing else but eyes and watches. More on that later. Jonathan talked me through the procedure and it went very smoothly. So we had 30 minutes remaining and decided to do some flying. 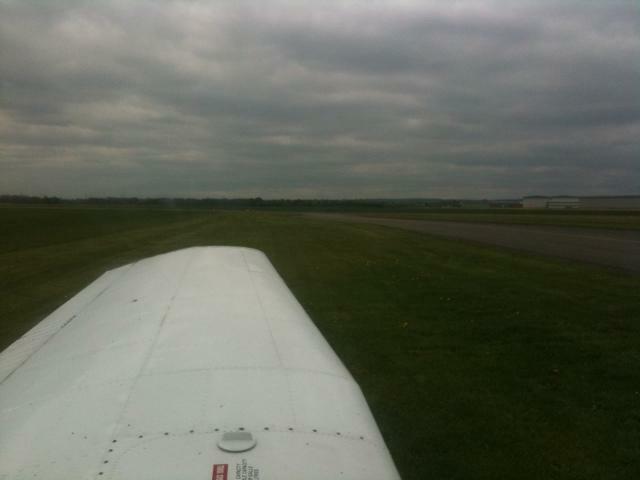 It was extra nice today because there was bit of a wind (a little extra challenge) and the runway in use was 24 grass which I haven’t used for quite a while. We only managed three circuits, which was fine. All went very nicely and instructor Jonathan seemed happy too, which always a good sign. I managed to get the Motion X track again by switching on Motion X and putting the phone back in my bag. Clever stuff. In the track below you can see the circuits and you can see that we have to avoid the villages on the circuit South Milford to the West of Sherburn, Monk Fryston to the South and Hambleton to the East. You can see clearly that I managed to avoid them all and that the circuits look pretty neat, considering the wind. Super cool. I’ll have to try capturing the track when we (hopefully) fly to Brid next week. A “circuit” in this respect means flying around the designated path for the runway in use and landing the aircraft without stopping (otherwise known as a “touch and go”). The final landing is a “full stop” landing of course.